How do you get ready for a trip? We are counting down the days to our upcoming four months stay in Italy. There is of course the usual preparation: reserving accommodation, car rental, opera and concerts tickets, arranging cooking classes and booking truffle hunt excursion, not to mention olive oil tasting, visits to the wineries and cheese making farms. But, I tend to do more than just that. Long before we leave on a trip I begin to read about the country, its history, art, architecture, culture and of course, its food, in an effort to learn and familiarize myself with our destination. Travel is an education and the learning begins at home, long before you pack the suitcases and head for the airport. I am not one for reading guide books. The format and information are a bit soul-less. I prefer to get my information from books about art and history, cookbooks and books written for travellers like myself, who are curious and feel at home in the world. I thought I’d share my recent reading list in case you are interested. Two books I revisited lately are written by Canadian Author Dan Brown. In his incomparable style he puts flesh and blood on long gone iconic figures such as Michelangelo and Brunelleschi, giving you a front row seat to watch Michelangelo paint the Sistine Chapel and Brunelleschi build the Dome in Florence. Another book is The Italians, a sophisticated view into a culture of people who brought us the renaissance and pulled humanity out of the dark ages into modernity. I also read about Cicero, a contemporary of Caesar, and learned about the fascinating world of Roma and the political operators of that era. Then there are books about how to travel in various areas and one of my favourite is Tuscany for the Shameless Hedonist (mea culpa) that offers specific information about what to do and where to go in this charming part of Italy. There is also Eating Rome, talking about places where Romans go to eat and is a must for any foodie travelling to Rome. I have several other books of this kind. I also read travel literature, mostly by women uprooting themselves from a predictable, comfortable life in North America and moving to Italy and later write about the adventure in these books. You know about Under the Tuscan Sun and there are a few new ones, A Thousand Days in Venice, and others by that same author. Back to the kitchen. We are leaving in a few short days and I am trying to empty the fridge but still find myself coming home with this or that. 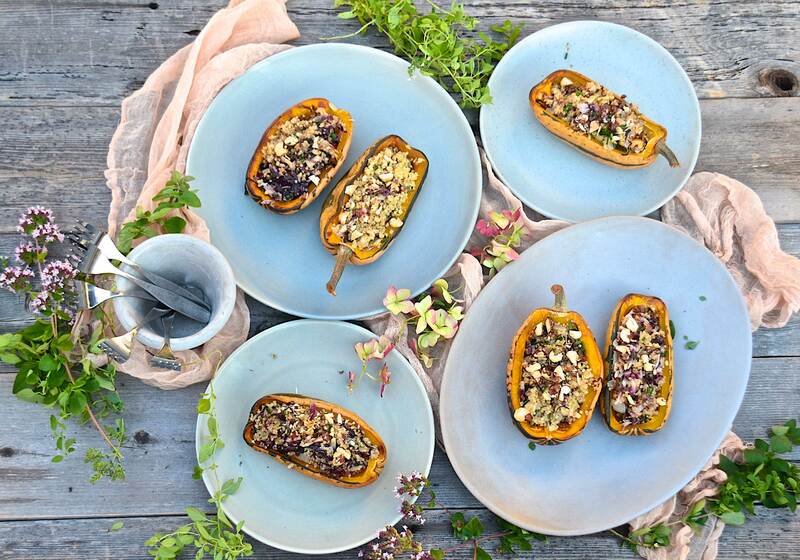 Fall cooking means root vegetables, winter squashes and soups simmering and filling the air with their aromas. 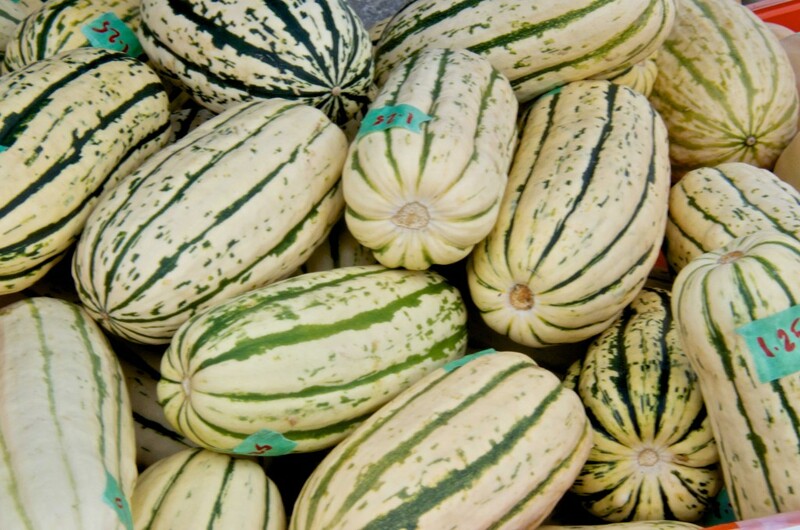 One of my favourite winter squash variety is Delicata, a striped beauty with tender flesh and thin, edible skin. I bought a few delicata squash at the market on Thanks Giving weekend and they have been sitting on my countertop waiting their turn until I finally got to them today. Roasting them is my preferred cooking method. I cut them in half, sprinkled a little brown sugar and poured a few droplets of olive oil into their cavities, then roasted them until they were tender. The Delicata has a sweet flesh, especially when roasted, so I thought I’d balance it with radicchio for its pleasant bitterness and a splash of sweet aged balsamic vinegar. I sautéed a little onion in olive oil, then added the shredded radicchio and cooked it briefly. While the onion was cooking I cooked a cup of quinoa and when it was done, I added it to the skillet with the onion and radicchio. Then I splashed it with aged balsamic vinegar and added chopped candied nuts. 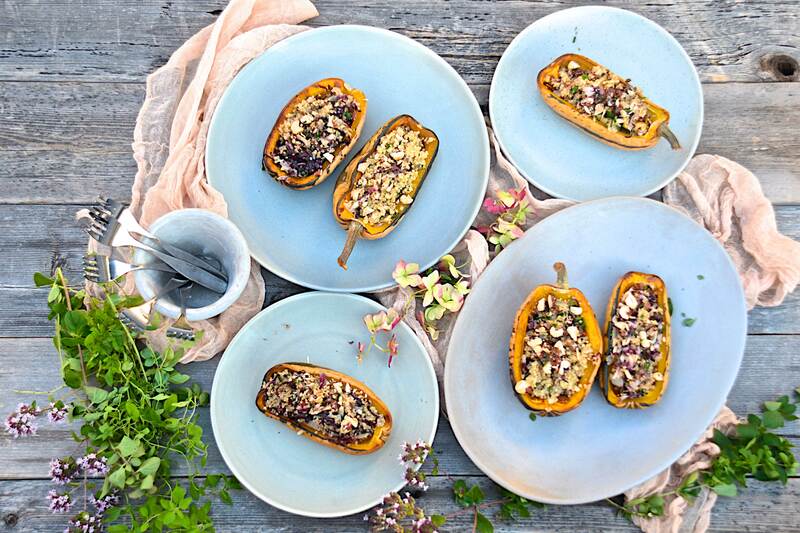 I spooned the mixture into the baked squash halves and it was definitely blog worthy, so here it is. 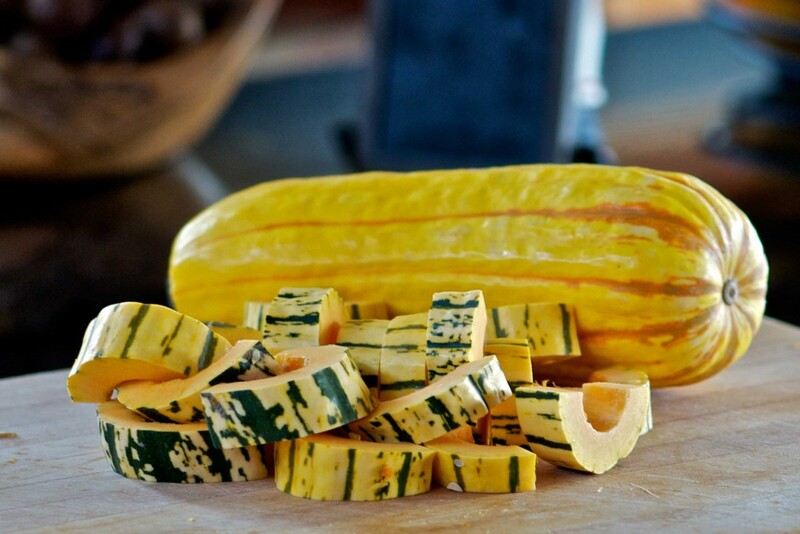 Cut the delicata squash in half vertically, scoop out the seeds. Sprinkle cavities with sugar and drizzle with a little olive oil. Place on a foil lined baking sheet, cover with another piece of foil and bake at 400℉ until tender. in the last 15 minutes remove the top foil and let it finish cooking uncovered. Any liquid that pools in the cavity will evaporate during the uncovered part of the cooking and the sugar will caramelize. Watch it so it doesn’t burn. When done remove from the oven and keep covered. While the squash is cooking bring 2 cups water and salt to a boil and then add the quinoa. Let the water return to a boil, then lower heat, cover the pot and cook until the water is absorbed and the quinoa is done. Remove from heat and let rest, covered for a few minutes. this allows the quinoa to absorb the remaining moisture and fluff up. While the quinoa is cooking heat the olive oil in a large skillet, add the onion and cook until translucent. Add the shredded radicchio and toss with tongs for a couple of minutes until wilted. Add the parsley or herbs (or both) and drizzle with the aged balsamic vinegar. Spoon the quinoa into the skillet and mix everything gently. Add 2/3 of the chopped nuts salt and pepper to taste. 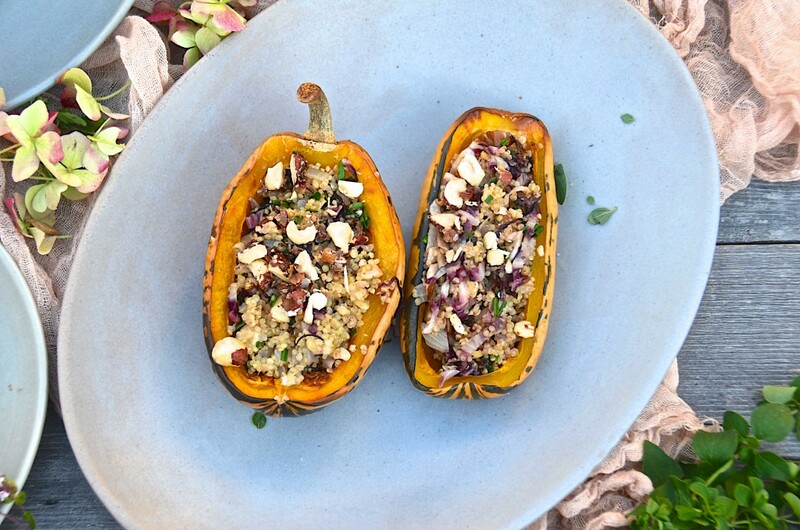 Spoon the quinoa mixture into the warm squash halves and garnish with remaining nuts. If you need to warm this up you can do so in the microwave briefly or in the oven, covered. You are a cooking angel, my guru, and a magician. Italy will never be the same. Hi Anne, love hearing from you, yes, I am your guru and don’t you forget it….and you are mine:). When are we going to travel together? Dina – When you are in Italy, you must go to the town of Portofino. it is not far from Genoa, has a population of only about 1,000 people and is one of the most beautiful places I have ever been. I was there on my cruise last May and had the most delicious fig gelato, which I was unable to find elsewhere in Italy. Your winter sounds delightful. Me, I’m back in Ajijic and ready for another of my Mexican cultural emersion years. I adore it here and now that I speak passable Spanish, it is even more special. Judi, always great to hear from you. Yes, I have been to Portofino and will definitely go back (G hasn’t been yet). Funny you mentioned the fig gelato. My memorable gelato was a think a pine nut one. I hope the weather is good for us to walk the path of the Cinque Terre. You are travelling a lot, how fun Judy. I am sure your Spanish is very good and I agree that it enhances the experience. Re: flour recipes, I know you don’t use those, I think about you when I post something that is more the style that you eat and cook. Enjoy Mexico and stay in touch.